For the fifth and final year, we are gathering to celebrate the Alabama oyster, the hard work of the oystermen, and Dr. Bill Walton's crew at the Auburn University Shellfish Laboratory. The Alabama oyster industry is growing! We now have 15 different oyster farms and commercial nurseries, and soon may have private hatcheries. With the help of the Alabama Oyster Social, our Alabama oyster farmers recovered from the challenges of 2016, including extended closures and the loss of the Auburn University oyster-farming park. In 2017, Auburn University opened up a new oyster-farming park in Portersville Bay and partnered with Alma Bryant High School to open up a second in Grand Bay. These parks are filling up with our displaced oyster farmers, as well as new farmers just getting started. But the challenges remain for these hard-working oyster farmers as they work to grow some of the worlds finest oysters! Over the last year, farmers struggled with high losses of their oyster crop over the summer, with some farms suffering devastating setbacks. Going forward, we hope to use the funds raised to help the Auburn University Shellfish Lab in its mission to assist the industry. To accomplish this, we are raising funds for the folks at AUSL to conduct cutting edge research and training all to allow AUSLs researchers and students to serve our own Alabama oyster farming industry! Funds will allow AUSL to develop improved strains of oysters, test new and improved ways of growing oysters, and ensure that oyster farmers are providing the freshest, safest oysters possible to consumers. We think of it as Oyster Farming 2.0! The 2018 Alabama Oyster Social has partnered with an All-Star roster of some of the South's most influential chefs as well as our friends from Evans Meats. The social will be featuring fresh-shucked samples washed down with libations provided by Back Forty Beer, Blackberry Farm Brewery, Clyde Mays Whiskey, Cathead Vodka, Grassroots Wholesale, International Wine, Alabama Crown, and Pinnacle Imports. 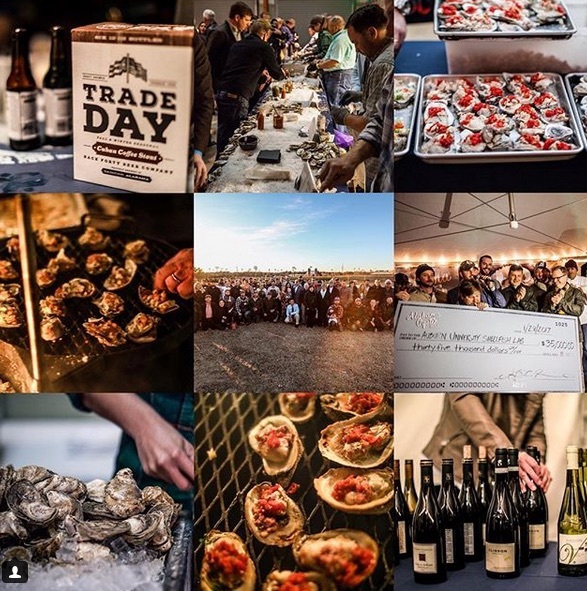 The tasting tables will feature southern fisherman, farmers, foragers, butchers, brewers, distillers, vintners, and shellfish enthusiasts all to highlight the progressive, sustainable efforts of Alabama oyster farms. All of the proceeds will be donated to the Auburn University Shellfish Laboratory in efforts to continue to serve this flourishing blue-green industry. We, the chefs, are asking for your support to celebrate the Alabama oyster but mainly because the oyster farmers need OUR help! On January 27th 2018,we will be hosting the fifth and final annual Alabama Oyster Social in Auburn, Alabama with a goal of raising $100,000. Please join our fundraising efforts by reserving your tickets for this year's rally! If you cannot attend this year's social, but would like to support these families through a donation, please stay tuned for more details.